After having typically appeared in the hallowed pages of Baseball Think Factory, Dan Szymborski’s ZiPS projections have now been released at FanGraphs for more than half a decade. The exercise continues this offseason. Below are the projections for the Seattle Mariners. Jerry Dipoto’s may be a one-man Hot Stove League, but at least based on the roster as of now — everybody could be traded by March — Seattle seems to still be in something of a no man’s land when it comes to rebuild. The Mariners aren’t actually bad, but it’s hard to envision them being that relevant in the AL West. There are a lot of older players here, but not many who really have all that much flip-potential. Sure, you can play some combination of Ryon Healy and Jay Bruce at first, or shift Edwin Encarnacion to first and make Bruce the full-time DH, or play Tim Beckham more than J.P. Crawford, but to what end? ZiPS is still rooting for a Kyle Seager comeback, but I’m a little less sanguine at this point. On the plus side, it thinks Mitch Haniger is for real and sees at least some value in Dan Vogelbach, even if the Mariners don’t seem to. And yes, I know Ichiro is pretty much just coming back for the M’s and A’s games in Japan, but ZiPS doesn’t know those circumstances. As disappointing as it feels, at this point, King Felix may be happy just to have a better end to his reign than Edward II did. The rotation lost its high end in the short-term with the James Paxton trade, but while the pitchers at the top have similar projections to the Orioles’ two top starters — a damning comp if ever there was one — it’s also a deeper group. They’re not likely to be good, but the Mariners have just enough of them that the situation isn’t unbearably bleak. That’s a bit how I think of a turkey burger; I wouldn’t seek one out, but hey, it’s actual food. There are a lot of unknowns with two of Seattle’s pitchers — Yusei Kikuchi and Justus Sheffield — so there’s legitimate upside here. Will it be enough to make the team a contender? No, but if we’re just talking about 2019 wins rather than the big picture planning stuff needed for the next good Mariners team, Seattle going .500 wouldn’t be all that odd, especially since ZiPS still projects the bullpen as adequate, which is probably the system’s biggest source of disagreement with Steamer when it comes to this roster. There are essentially two prospects in the high minors who ZiPS likes over the long-term: Sheffield and Justin Dunn. Jarred Kelenic hasn’t left rookie ball yet, so I don’t think we’re at the stage where ZiPS has much to contribute. But if Kelenic matches the .286/.371/.468 line from his debut at higher levels, I’m sure the computer will like him just fine. After that? Pretty much nothing as far as ZiPS is concerned. It sees Shed Long as a role player who might have some pop, and Braden Bishop has defensive value, but there’s little algorithmic interest in players like Kyle Lewis or Evan White. Lewis in particular still hasn’t had a breakout with the bat and the knee injuries cloud whether he’ll be able to play centerfield, which is probably a necessity for his future value. 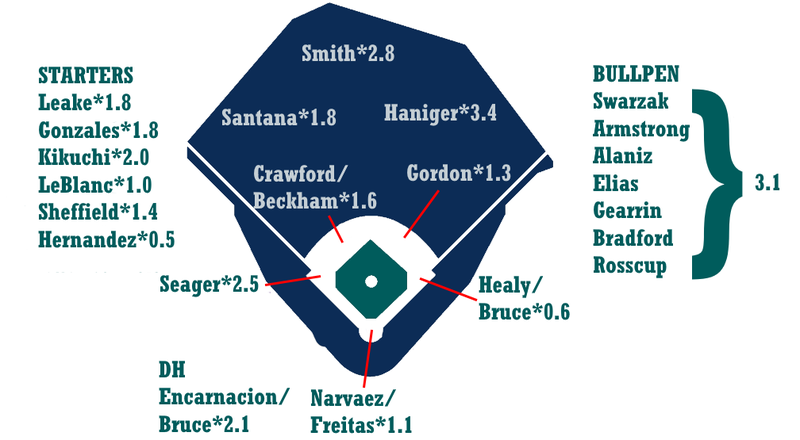 We hoped you liked reading 2019 ZiPS Projections – Seattle Mariners by Dan Szymborski! There is one lie in this piece: our depth charts don’t have Kikuchi in them, so I clicked that red ZiPS Override Switch and changed up the rotation depth chart on my end.